This Asturias, the second Royal Mail Line ship of that name, was built by Harland & Wolff, Belfast and launched in 1925. Registered to Royal Mail Meat Transports, Ltd. (a Royal Mail Steam Packet Co. subsidiary), she made her maiden voyage from Southampton to La Plata (River Plate), Argentina, on 26 February 1926. 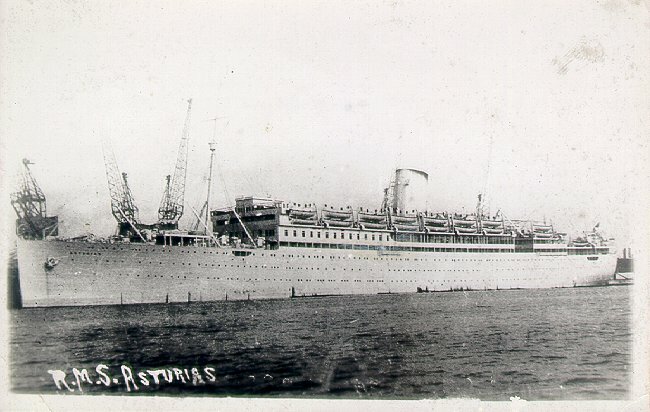 In 1932, Asturias was re-registered to Royal Mail Lines, Ltd., together with the rest of the Meat Transports fleet. Originally fitted with diesel engines, Asturias was refitted in 1934 with turbine engines, and made her first voyage as a steamer in September of that year. After being taken over as an armed merchant cruiser in 1939, her forward funnel was removed, leaving her with only a single stack, as she is shown here. While serving in the South Atlantic in 1943, she was torpedoed and badly damaged by an Italian submarine, and was towed to Freetown, where she was abandoned as a total loss. The British government took her over in 1945 and had her towed first to Gibraltar, and then to Belfast, for repairs and conversion into a troop carrier. After the war ended, she continued to serve as a troop transport and also saw service as an emigrant ship to Australia. She was sold for breaking up in 1957. Interestingly, before being broken up, she was lent by the breaker, Thomas W. Ward, to the Rank Organisation for use in the film "A Night to Remember". Asturias' port side was used to depict Titanic in the lifeboat-lowering scenes of the film even as the shipbreakers were at work on the starboard side. Once filming was completed, demolition was as well. Sources: Haws' Merchant Fleets; Mallett and Bell's The Pirrie-Kylsant Motorships; Mills' The Titanic in Pictures.